What does it mean to say that a negative morpheme is specified for semantic negation while another negative morpheme is not? Moreover, this paper really only discusses the sources of negativity as a prerequisite to its primary aims¹, but nevertheless I think it sums up the issue quite nicely. That, plus the fact that it doesn't hedge during this preamble, or explicitly dissent from previous authors (except a couple minor caveats as footnotes), as academics are wont to do at the slightest whiff of debate, tells me these definitions are probably uncontroverial among linguists. The paper is relatively modern, too. We Must Reverse The Polarity! To elaborate a bit, we must first establish a method for determining whether a word (or morpheme) is negative in the first place. Here, the authors employ what's called a "Negative Polarity Item", or NPI, as a tool to that end. The students left, and all the teachers left too/*either. The students left, and none of the teachers stayed *too/either. The students left, and few of the teachers stayed *too/either. The students left, and the teachers hardly stayed *too/either. Note that in (1), the word either is impossible, because it is a positive assertion, whereas in the following three examples (2-4), it is possible to use either (and impossible to use too) because they're all in some way negative. They all contain a negative morpheme. At the same time, it has also been noted that these syntactic diagnostics are sufficient but not necessary properties of explicit negation. For some cases of explicit negation, although a negative meaning is asserted, the syntactic tests above are not applicable. Consider, e.g., the exclusive focus particle only. By saying Only John read the article, one asserts content equivalent to that asserted by the exceptive sentence Nobody other than John read the article. It is generally agreed that this negative exclusive component is part of the asserted meaning of only, even though only does not have negative morphology, and is not syntactically negative based on the tests above†. †There are good reasons why the syntactic tests [above] do not apply to only (or negative exceptives in general, such as nobody other than). For example, one cannot say *Only Bill read the newspaper, and John did either. The particles either or neither are additive – they would require somebody other than Bill to read the newspaper – which clashes with the negative exceptive meaning of only. So, the fact that only fails the either test does not tell us anything about its negativity, it is merely a case where the test cannot be applied. So you can see here they are starting to set up a taxonomy of negativity; ultimately they set up two kingdoms, explicit negativity and implicit negativity (this last being what you're asking about here). Within the first kingdom, explicit negativity, they identify three families, and within the second kingdom, implicit negativity, just one (per the table above). I'll come back to implicit negativity in a second, because ultimately it is the answer to your question, but first we need to know what it is being contrasted against, i.e. the three families of what the authors label explicit negativity, which is what I take you to mean by semantic negativity, i.e. that the morphemes' actual meanings somehow carry and convey the "negativeness". 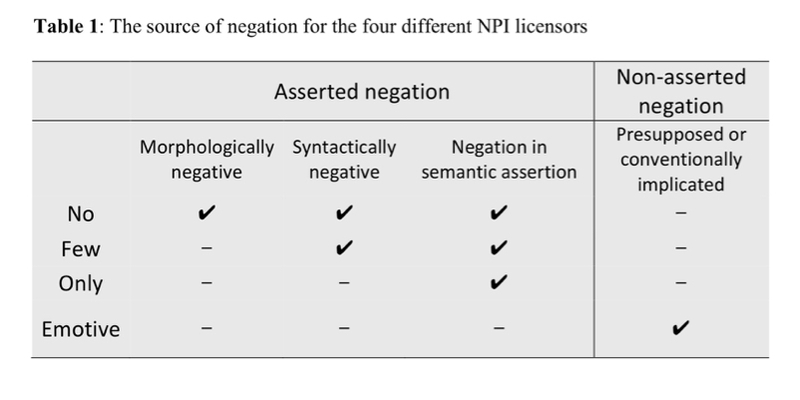 The licensor no is the canonical morphological expression of negation, in addition to being both syntactically (bearing the syntactic feature [+Neg]) and semantically negative; few is also syntactically and semantically negative, but does not contain an overt negative morpheme; only asserts a negative meaning through its exceptive component (nobody other than), but it is neither morphologically nor syntactically negative; only asserts a negative meaning through its exceptive component (nobody other than), but it is neither morphologically nor syntactically negative. So the first family, morphologically negative, are what we, laymen, would intuitively and categorically consider "negative words". The ones with "no"' somehow part of their structure. The second family, syntatically negative, are the sneakier form of negation we can easily catch with our NPI diagnostic from above. The third family, negative in semantic assertion, are the remainder, and it's sometimes not possible to catch them with specific NPI diagnostics, but they can still be identified. Now it's these latter two categories which I, in my endless naïveté, would have assumed are what your quote meant by "not semantically negative", because they're not morphologically negative: not negative on their face. But that's not how linguists use the term (the category label negative in semantic assertion should be a clue), and this is where it gets juicy: just what is in that second kingdom, implicit negativity, or what your quote calls "non-semantic negativity"? Implicit negation, on the other hand, involves negative meaning whose source is pragmatic (presupposition or implicature). For current purposes, we consider the class of “emotive” predicates, which trigger negative inferences, though their negative content is not asserted. Emotive verbs depict certain emotions or attitudes (hence the term “emotive”) towards the content of an embedded clause, which is presupposed to be true (hence the term “emotive factive”). Examples of emotive predicates include be amazed, be sorry, be surprised, be lucky, be disappointed, be irritated, regret, etc. John was amazed that the tofu was so delicious. John was lucky that he passed the exam. John was surprised that he got the last ticket to the game. So, bottom line : "non-semantic negative morphemes", what the paper calls "implicit negatives", are morphemes which create a negative context, sufficient to pass the NPI diagnostic, through pragmatics, not semantics, either implicature or presupposition: unstated facts which must be true, either as a cause (presupposition), or as a consequence (implicature), of the stated assertion, if the utterance is to be considered true. Which is to say, the negativity of "negative non-semantic morphemes" arises from what's not said, but which must necessarily be true nevertheless based on what has been said. These morphemes tend to be emotive in nature, such as be surprised, be irritated, regret, etc. ¹Resolving the apparent contradiction between the well-supported "strong incremental hypothesis" and the existing body of evidence which suggests "negativity" is processed ex-post-facto, after the positive form of the statement, the assertion, is understood. Interesting stuff. Not the answer you're looking for? Browse other questions tagged meaning syntax negation semantics or ask your own question. What does “persay”/“per say” mean? In certain case, double negation doesn't cancel the negation? What does 'per say' mean in this context? What does “semantic” mean when used dismissively? What does “distributional” mean in grammar? What does informed consensus mean?